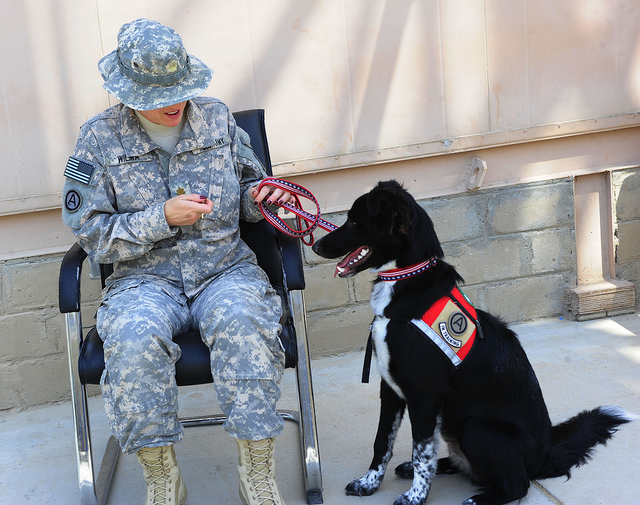 Maj. Alisa Wilma, Area Support Group – Kuwait, command veterinarian, shows Luka, Red Cross volunteer and member of the human-animal bond program, a treat during a recent visit with troops. Luka and Grayson the cat are available through Red Cross for any person who has a need to spend time with a cat or a dog. Through programs like this, Third Army is continually taking care of the emotional and physical needs of deployed service members while continuing to educate leadership on how to better take care of their soldiers. U.S. Army photo by by Staff Sgt. Regina Machine.